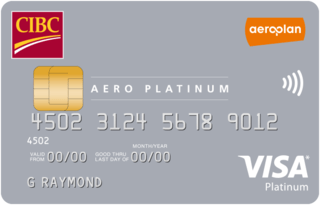 The CIBC Aero Platinum Visa Card currently has an Informr score of 8.2 out of 10. This score is based on our evaluation of 1 sources including reviews from users and the web's most trusted critics. CIBC Aero Platinum Visa Card is typically available to those with good credit scores (650 or greater). Yes Have a minimum personal income of $18. A low fee card that gives you a nice sign up bonus and lets you earn Aeroplan Miles everywhere you shop. Earn miles twice at over 150 Aeroplan Partners and 100+ online retailers.